Paris Summer Festival, open-air cinema and Paris Plages; long live the Parisian summer! Paris has a host of surprises for you in the summer! Several festivals bring a breath of sunny fun and excitement to the capital. The Paris Summer Festival offers all kinds of live entertainment, there’s open-air cinema at La Villette and also the seaside resort pleasures of Paris Plages. There’s so much to enjoy that you’ll not want to miss any of it! From July 16th to August 4th, Paris opens her arms to embrace contemporary creation in all its myriad forms! Discover the great talents due to be presented in a series of live shows running the gamut from music and dance to theatre performances, not forgetting circus and magic acts! The festival unfolds in many places, mainly outdoors, and many of the shows are free. You’ll be able to enjoy performances in conventional venues, but also have the opportunity to catch some taking place in settings as unusual as swimming pools, schools and parks. On the choreography side we find the great artiste Olivier Dubois, a superb dancer and renowned author. In the theatrical sphere, Joël Pommerat offers his latest creation. Meanwhile, the performers of the Galapiat Circus will impress you with the show Capillotracted (Far-Fetched). Make the most of the season’s sunshine in the capital with the transdisciplinary Paris Summer Festival! Outdoor cinema at the Villette: How about singing? From July 18th to August 19th, the lawn of the Parc de la Villette welcomes you for long summer evenings spent enjoying the silver screen magic of the 7th art. Every year, the Villette open-air film festival delights moviegoers and this year will be particularly fun, with a joyful, song-oriented programme of screenings. Lovers of musicals, biopics of musicians and concert footage are invited to La Villette to sing along together. As soon as night falls, the huge screen comes alive with blockbusters, cult movies and art films, much-loved classics and recent releases for you to enjoy while comfortably ensconced on the grass. Bring a picnic or some snacks to nibble while you watch your favourite movies and discover some that will become your favourites! Events are organised on the sidelines of the festival, including a Musical Cruise aboard a houseboat on the canal, where a gourmet menu complementing that evening’s film session is offered. The annual Paris Plages (Paris Beaches) event once again brings all the fun and games of a beachside holiday right into the centre of the capital! Take the opportunity to cool off in one of the temporary swimming pools floating in the Bassin de la Villette. Many activities are offered on the banks of the Seine, including petanque tournaments, tango classes, comic book workshops and concerts. Or if you’re simply in the mood to relax, grab a deckchair and an ice cream, or sip a mojito with your feet dangling in the water. To make the most of your stay in Paris you’ll want to find a hotel that is outstanding both in terms of its level of comfort and for the multitude of services that it has to offer. 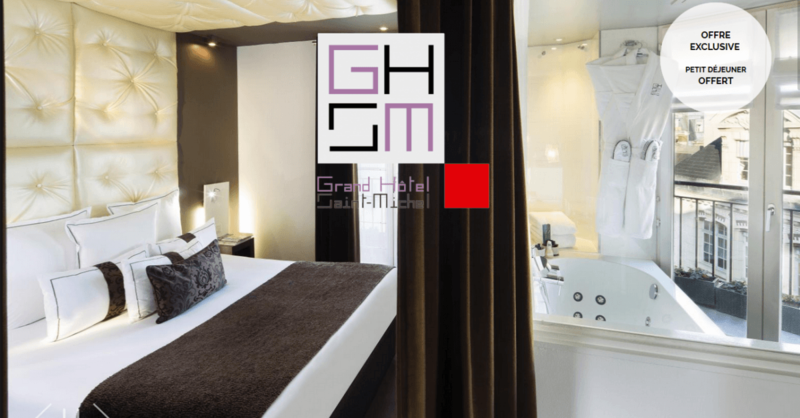 At the Grand Hotel Saint-Michel, you will not only benefit from superb, well-appointed, quiet and bright rooms, but you can also call on many services, including babysitting, the booking of tickets for various events, and much more. You can also enjoy a personalised welcome with champagne and sweets in your room. Pamper yourself this summer during your getaway at the Grand Hotel Saint-Michel, located in the centre of Paris.